We know that Google will be unveiling the next generation of Pixel phones at its hardware event on October 4. But for those who can’t wait until next week, a major leak has revealed most of the handsets’ specs (and now photos are available, too). Android Authority uncovered the spec details, which it claims to have verified independently using an internal document. While much of the hardware is what we expect to see in virtually all of today’s flagship Android devices, there are a couple of surprises. Like the Note 8, S8, LG V30, and several others, the Pixel 2 XL will feature Qualcomm’s Snapdragon 835 processor. The handset has a curved QHD display, and a screen-to-body ratio of between 80 and 85 percent, meaning this phone is joining the minimum-bezel revolution. The base storage for the Pixel 2 XL will be either 64 GB or 128 GB, and while dual speakers will reportedly be a feature, previous rumors that it will lack a 3.5mm headphone jack appear to be true. Android Authority also suggests only certain markets will receive USB Type-C headphones in the box. Although the Pixel 2 XL only has a single rear-lens camera, it’s still an area where the handset could excel, thanks to the Wide Color Gamut and Google Imaging Chip alongside the Optical Image Stabilization. It could also have OIS in the front-facing camera. Other specs include a new generation of fingerprint scanner, IP67 dust and water resistance, Gorilla Glass 5, and an impressively large 3,520 mAh battery. But the most interesting feature is the inclusion of an E-SIM slot, which, if true, would allow users to connect to different networks without having to replace their SIM cards. 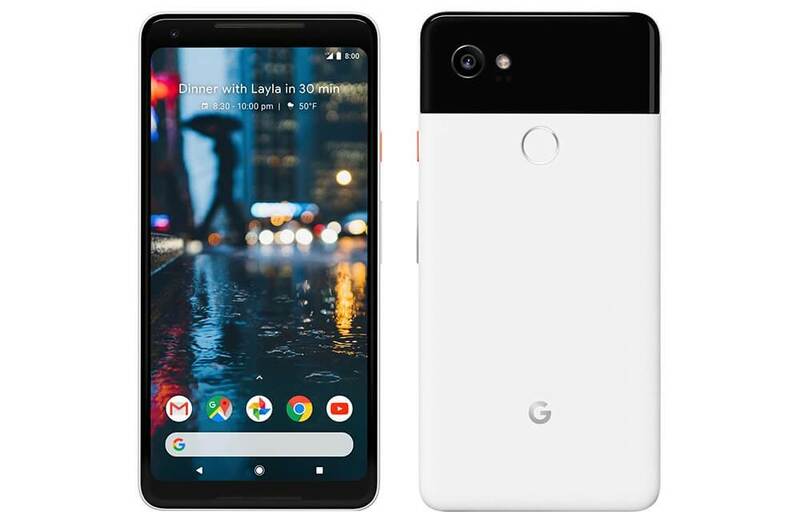 The smaller Pixel 2 handset has many of the same features as its larger sibling, with the exceptions of a 1080p flat screen and a 2,700 mAh battery. Additionally, both phones come with the squeezable Active Edge feature and are said to offer unlimited Google cloud storage until 2023. I'd actually forgotten these things were on the horizon. Oh well, they're of no interest to me anyway. No headphone jack is a big no for me. Most interesting thing for me is the E-SIM. I really don’t see why in 2017 we need SIM cards. It smells to me of the network providers desperately clinging on to an outdated method of tech that does nothing but make things more difficult for consumers. The rest is just like any other Android flagship, amazing spec numbers but at the end of the day will be let down by the lacklustre Android operating system which visually hasn’t changed for about 6 years at this point and has a 20th century attitude to RAM management. Oh how disappointed I was to find out that Blackberry now use Android. I wonder what other normal google services that have been around for years will be rebranded and marketed as new for the Pixel 2. Because until now, there were only two choices in network technology: CDMA and GSM. CDMA is built-in hardware and the network is based on white listing. GSM is removable hardware and isn't based on listing 'approved' hardware addresses in some database. GSM networks are the more pro-consumer network as you can swap out SIMs card and happily move to a new network - no one can stop you from taking your phone with you. Now, with eSIMs, we're looking at something in-between CDMA and GSM. As long as they don't try to play games with being able to store these new software-based SIMs, I'm fine with it. But switching from hardware to software does begin to open it up to the kinds of "no, you can't do that" games that CDMA networks are infamous for. No interesting features at all frankly except for the lack of 3.5 mm jack. I am really hoping this times for more honest reviews, and less issues once they are gonna reach the market, the previous iteration wasn't exactly what you'd expect after spending a fortune on that crap.